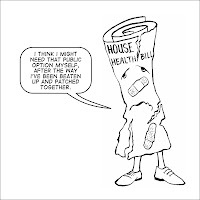 I Me My: The 'Health Care Overhaul Bill' Passes in the Senate - Obama's First (amputated) Deliverable? The 'Health Care Overhaul Bill' Passes in the Senate - Obama's First (amputated) Deliverable? The Health Care Overhaul Bill was passed in the senate on a party line vote of 60 - 39, and President Obama called it “the most important piece of social legislation since the Social Security Act passed in the 1930s ......With today's vote, we are now incredibly close to making health insurance reform a reality in this country,.... Our challenge, then, is to finish the job. We can't doom another generation of Americans to soaring costs and eroding coverage and exploding deficits." it will almost certainly increase by at least 30 million the number of people covered by government and private health insurance. it will allow families free preventive health care such as well-baby visits and mammograms. hope you are enjoying of a lovely Christmas, it seems that we are getting a x-mas present after all with the passing of the bill. This is good news. I have always appreciated the welfare-state model (not just with health). But what are the criticisms, if any? A step in the right direction for sure! Can't say anything about this health care bill. But let me wish you a happy ending of this years' toil and and good luck for the next one, number ten. Enjoyed some of your stuff on the blog.